5 million miles later, and Atlantis has arrived home with a thud, and likely a few tears in Nasa employees' eyes. 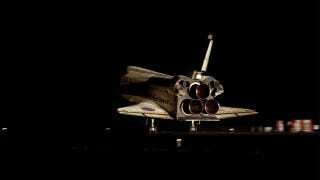 Watch the Last Space Shuttle Launch. Ever. Right Here. Touching down at the Kennedy Space Center in Florida early this morning, Commander Christopher Ferguson, Pilot Douglas Hurley, Mission Specialist 1 Sandra Magnus and Mission Specialist 2 Rex Walheim returned Atlantis safely home after the space shuttle program was disbanded.